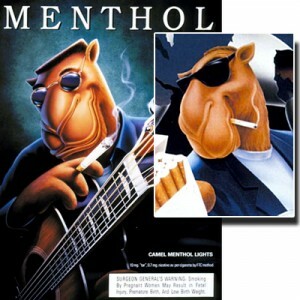 In the 1980s, R.J. Reynolds used one version of “Joe Camel” to market menthol cigarettes to African Americans (left), and another version (inset, right) to market to caucasian populations. It’s own Tobacco Products Advisory Scientific Committee (TPASC) concluded in 2011 that menthol cigarettes increase hazards to human health, but even now — fully two and a half years later — the U.S. Food and Drug Administration (FDA) is still dragging its feet in acting on the information. Yielding to pressure from tobacco companies, on September 4, FDA (pdf) delayed deciding what to do about menthol for yet another two months, asking for more public comment. A scientific study commissioned by FDA and published in March of 2011 (pdf) found that cigarette companies add menthol at trace or “subliminal” levels to all cigarettes to manipulate the sensory perception of smoke. FDA’s scientific advisory committee studied the relationships between menthol cigarettes and public health, and concluded that menthol cannot be considered simply a flavoring additive in cigarettes because it has distinct pharmacological actions. It reduces the harshness of smoke and irritation from nicotine — both characteristics that make it easier for kids to start smoking. Menthol also may make it harder for some people to quit, and the evidence suggested use of menthol cigarettes can lower responsiveness to medications. TPSAC concluded that there are no public health benefits of menthol compared to non-menthol cigarettes. TPSAC also found use of menthol cigarettes is highest among minorities, teenagers and low-income populations, and particularly heavy among African-Americans. Cigarette companies have long disproportionately marketed menthol cigarettes to African Americans. A Stanford University School of Medicine study found cigarette companies market mentholated cigarettes in a predatory manner designed to lure African Americans into becoming smokers. They advertise menthol cigarettes more heavily in areas with higher African American populations, and lower the price of menthol cigarettes in stores located near high schools with large African American student populations.